Most international students who arrive in Korea already got issued a visa for South Korea in their home countries. 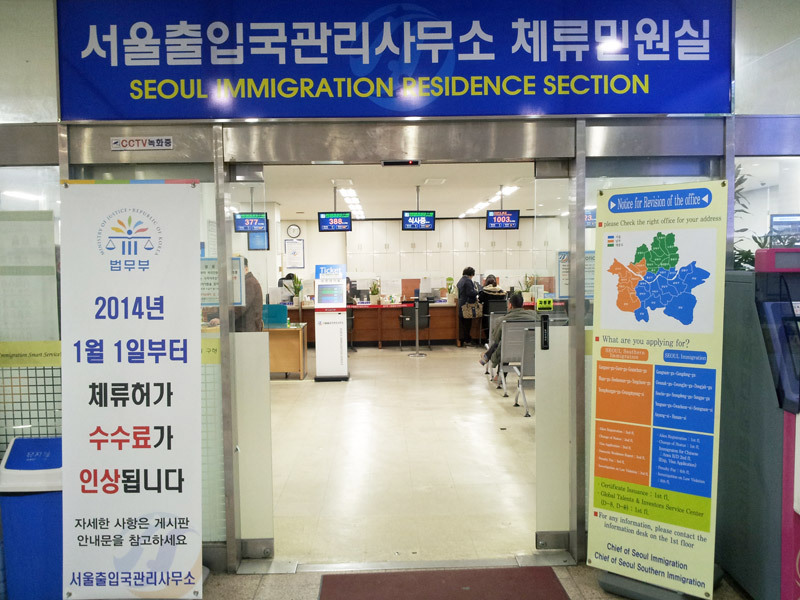 Although this visa constitutes the permission to stay for a specified duration, foreigners are required to register once they arrived in Korea (and intent to stay longer than 90 days). This process is called alien registration and has to take place within 90 days after arrival. Experience shows that it is recommended to take care of the registration as soon as possible as 1) you are likely to postpone it further and further and might forget about it in the end and 2) the alien registration (card) is required for certain services in Korea, e.g. banking. The Immigration Office opens at 9:00am. It is highly recommended to visit the office in the early morning, preferably already before 9:00am, in order to avoid a long waiting time. Also, it is possible to make a reservation via phone in advance (see bottom of this page). Omokgyo Station can be reached by Subway Line 5. From Wangsimni or Majang Station it takes around 40 minutes to get there. 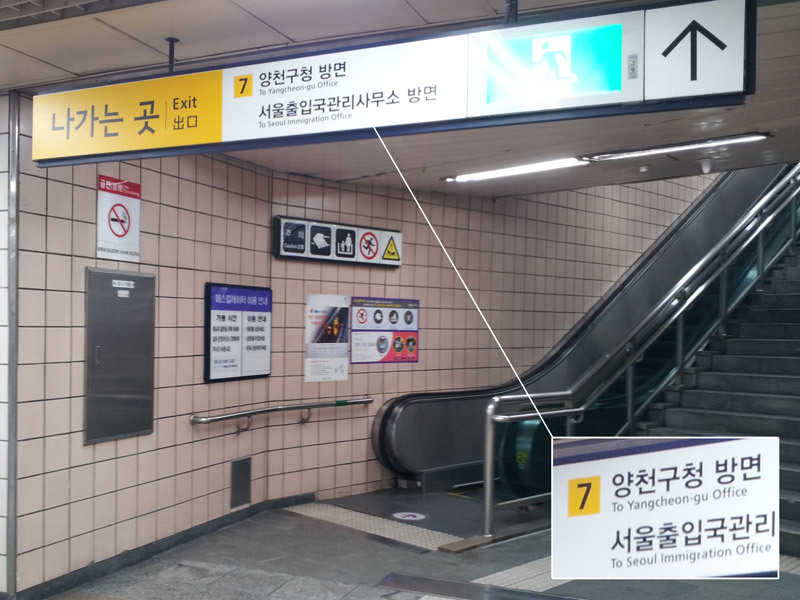 When you have arrived in Omogkyo, please find Exit 7 which is labeled “Yangcheon-gu Office”. Upstairs you will find a Hana-Bank to your right. Simply go straight and follow the street for about 5 minutes. During this walk you will cross two other streets and, eventually, you will pass an Audi-Car Center. Here, the main street slightly bends to the right. Again, just keep on following the street for 2-3 minutes more (as a street sign tells us that the Immigration Office is located only 250m from here). At the end of the street, you will be already able to spot the Immigration Office just across the street (to your left). Cross the street and enter the building. Seoul Immigration Office… just across the street. The display on the right tells us which office is correct. 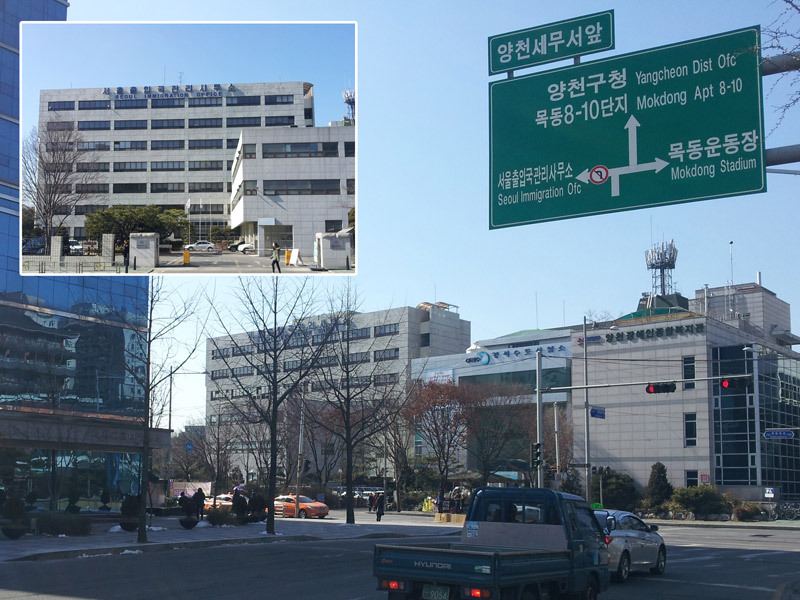 As Wangsimni and Majang belong to Seodong-gu, the blue office in the 1st floor – i.e. the office right in front of you – is in charge of your alien registration. Enter the office and receive a number (an usual procedure in South Korea that can be also found in banks or post offices). If you want to save some time, you can also download the application form at home and prepare everything necessary in advance. Just go to “Hi-Korea: eGovernment for Foreigners” and download the application form as a .pdf- or .doc-file (follow the instruction at the end of this page). In addition to the application form, you further need to hand in A) one pass photo (3.5×4.5cm) and B) a copy of your passport (make sure to bring your actual passport too). 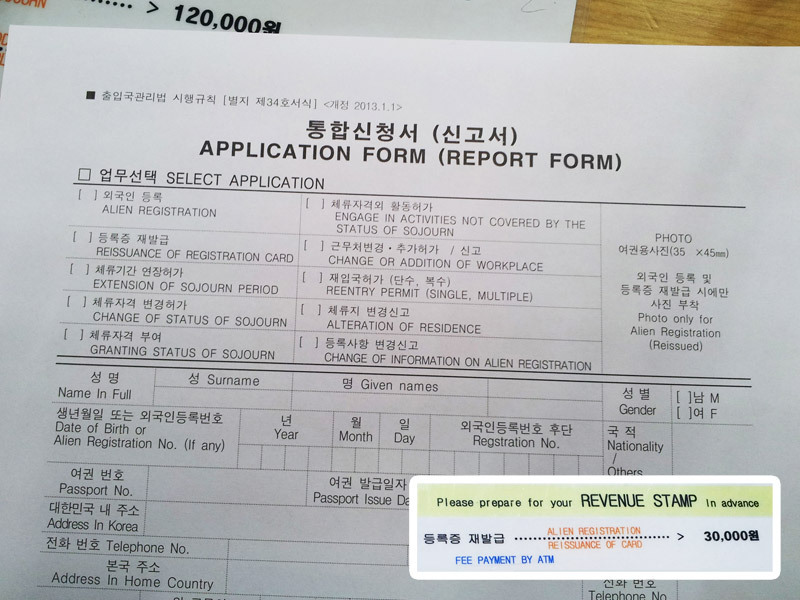 Important: The registration fee (KRW30.000, according to the price-list in the office; information on the internet differs) is payable BEFORE handing in the documents. The payment is confirmed in form of a “stamp”. 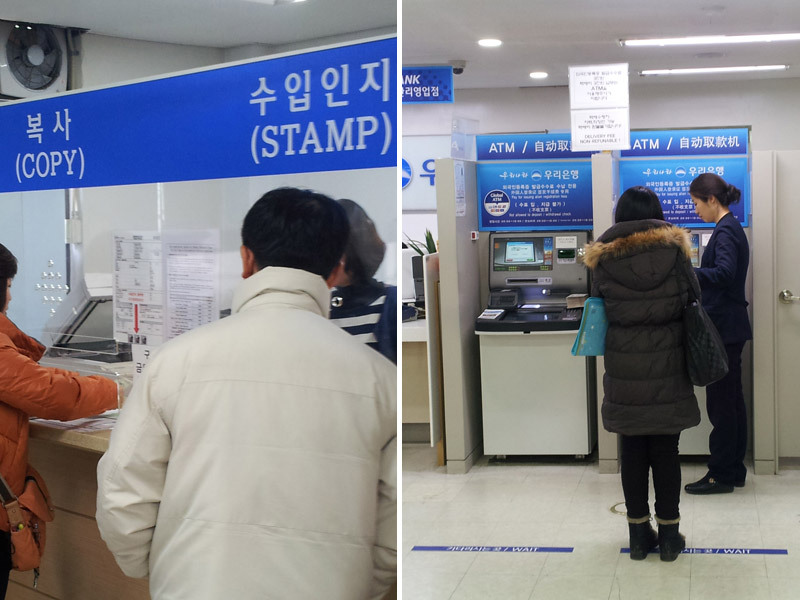 To make a payment and eventually receive the required stamp, please go up to the 2nd floor and enter the red office labelled “Seoul Southern Immigration Residence Section”. Turn left and you will spot a small booth in the left corner after a couple of meters. Show the employee your application form to indicate what your payment is for (=alien registration). The employee will point to the ATM to your right side, where you are supposed to make the actual payment. Another employee will help you with that (either they speak English or use written English instructions). When having paid, go downstairs again and wait till your number is shown on the display. Hand in the documents and wait till the employee hands a preliminary registration certificate over to you. This certificate already includes your alien registration number. The card will be handed out 2-4 weeks later. 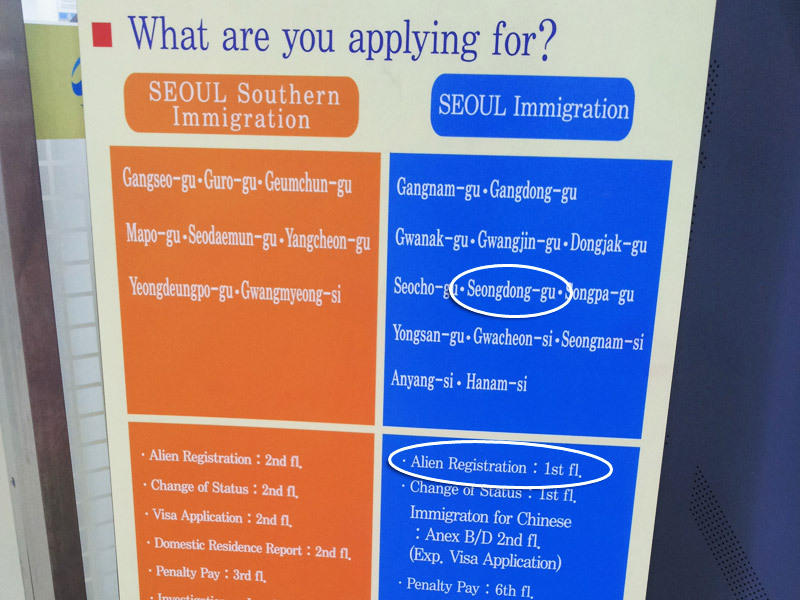 The alien registration card can be received either 1) by picking it up from the Immigration Office in person (do not forget your passport) or 2) via mail delivery to your address. In the latter case, you are supposed to mention the mail delivery service when making the payment (probably, the employee will ask you anyways). At the time this article was written, the delivery fee was KRW3.000. However, it should be noted that the mailman will only hand out the alien registration card in person. In case, you are not at home at that moment, the card will be kept on hand for you at the next post office (for around one week). 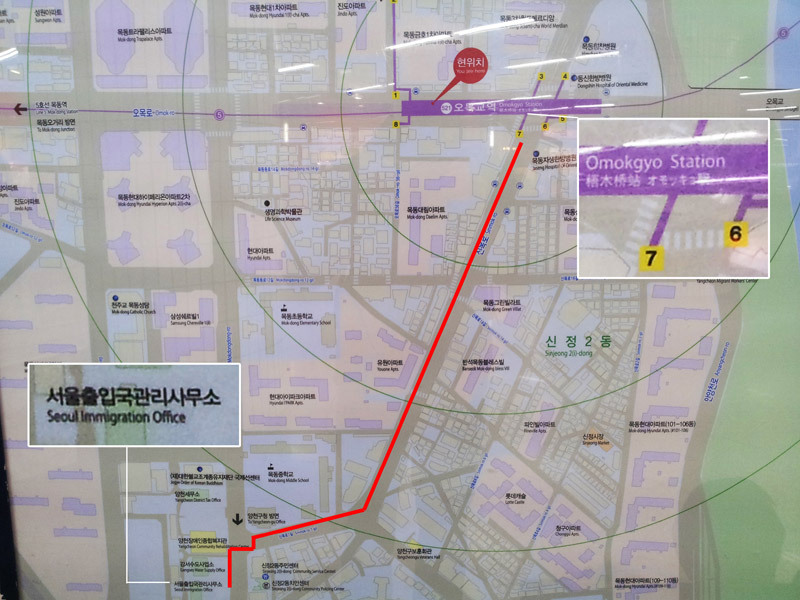 How to get there: Omokgyo Station (Subway Line 5), Exit 7, Go straight for about 10 minutes.